Keener's commentary explores the Jewish and Greco-Roman settings of John more deeply than previous works, paying special attention to social-historical and rhetorical features of the Gospel. It cites about 4,000 different secondary sources and uses over 20,000 references from ancient literature. 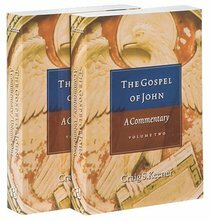 About "The Gospel of John (2 Volumes)"